There’s nothing I hate more than the sound of my alarm clock going off. The buzzing, buzzing buzzing sound waking me from my deep slumber and my pleasant dream of eating artichokes with a spicy aioli dip that I effortlessly whipped up, while not only entertaining a house full of famous foodies, but doing it all in 5 inch heels & pearls with a bottle of champange in one hand and a whisk in the other. But that is neither here nor there. Ah, to dream the loveliest of dreams. Too bad in four days my dream will somehow become a reality. On Friday, I’m jetting off to Santa Barbara, California for “Edible Institutes,” a weekend of food writing, food demonstrations, writing workshops, and the chance to star in your own television show, etc, etc. You know – the usual. Since my mind was in a sunshine, mai-tai, palm-tree induced haze, I was incredibly unprepared for what hit me smack in the face as I stepped outside a half hour later. Cold. Snow. And the worst, wind. With my slightly worse for wear UGG boots, my leather gloves that provide no insulation whatsoever and my bright pink hat that slipped over my eyes with the first gust of wind, I truly felt ready to tackle the cold. That was until, ten steps later, I slipped on the ice, grabbed hold of the side of the building, and let my feet go flying. Trying to adjust my flailing body, I couldn’t help but notice the sympathetic head nod and rambunctious giggles coming a middle-aged woman and her children, who were all donning earmuffs and rainboots, which I’m sure, must have had alot of damn traction. 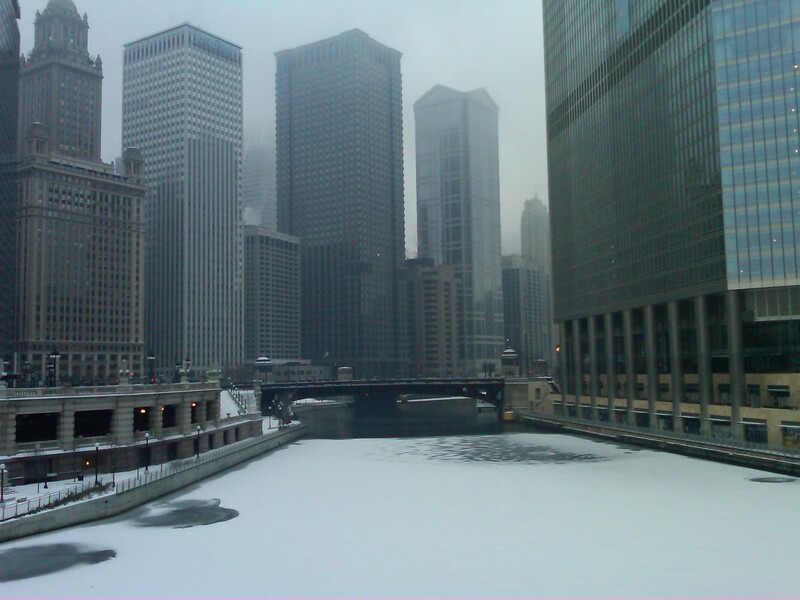 Chicago, I love you. But how can I not dream of California when you're looking so damn dreary? As I continued my adventure (that’s really an understatement – you try walking around in boots with below zero traction), I again started to dream of my favorite things – cupcakes. Move over Sprinkles, there’s a new cupcake in town. I would like you all to meet, Crumbs. To make things even sweeter, I was introduced to the chief development officer of Crumbs, Harvey, when he came into Quartino for dinner on Sunday night. After gushing to my manager how I love cupcakes so, he graciously introduced me, informing Harvey I had just eaten at Crumbs the day before. We talked all about cupcakes (is there really a more interesting subject?) and I told him all about my favorites. 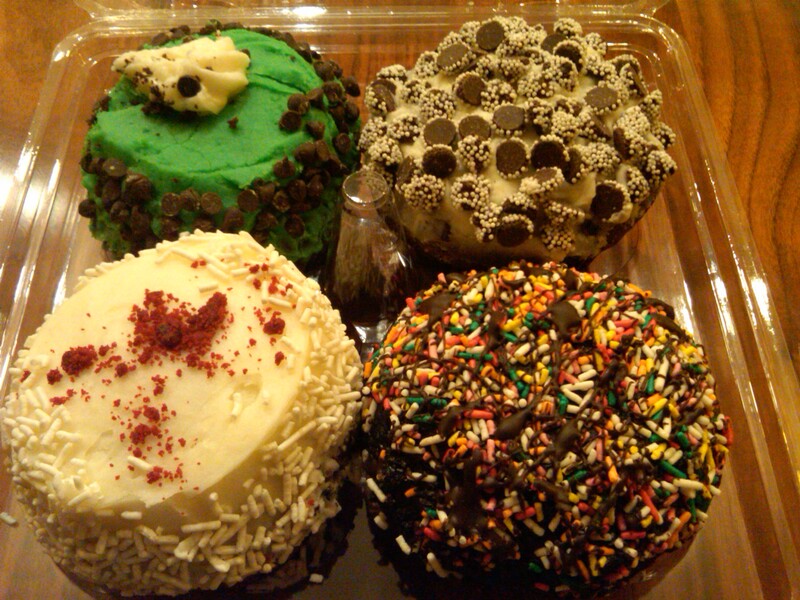 Crumbs has over 42 flavors daily, and not to mention, their cupcakes are MASSIVE in size and flavor as well. http://www.crumbs.com/. What impressed me most about Crumbs, though? My girlfriends and I didn’t get there until 7pm and when we cut into them fifteen or so minutes later, the cake was still extremely moist. Quite a big deal, at least for me. And yes, I actually hate that word “moist”. Ick. But it fits in this situation. So, forgive me. 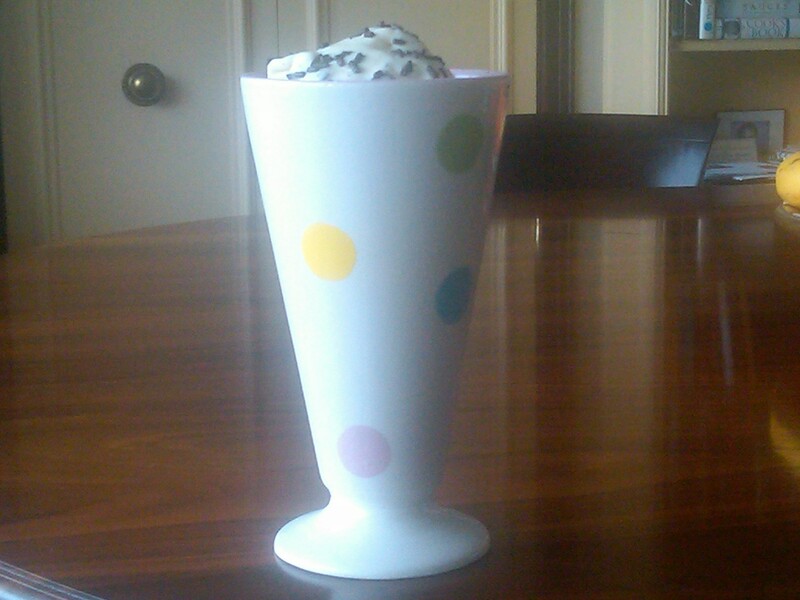 Now, as if life couldn’t get much sweeter, I decided to make some homemade gelato for the first time. I figured it was finally time to test my new ice cream maker out and make some good use out of my “Ciao Bella Book of Gelato & Sorbetto,” cookbook. Most people when they hear “Ciao Bella,” ice cream, they think of the brand’s famous Blood Orange Sorbetto or Blackberry Cabernet sorbet (which I have the recipe for, taste tester’s welcome! ), but I beg people to try out their gelato. It is to die for and my first attempt didn’t make a ton of ice cream, but it made just enough for this day. 2) Gently whisk the vanilla into the base. 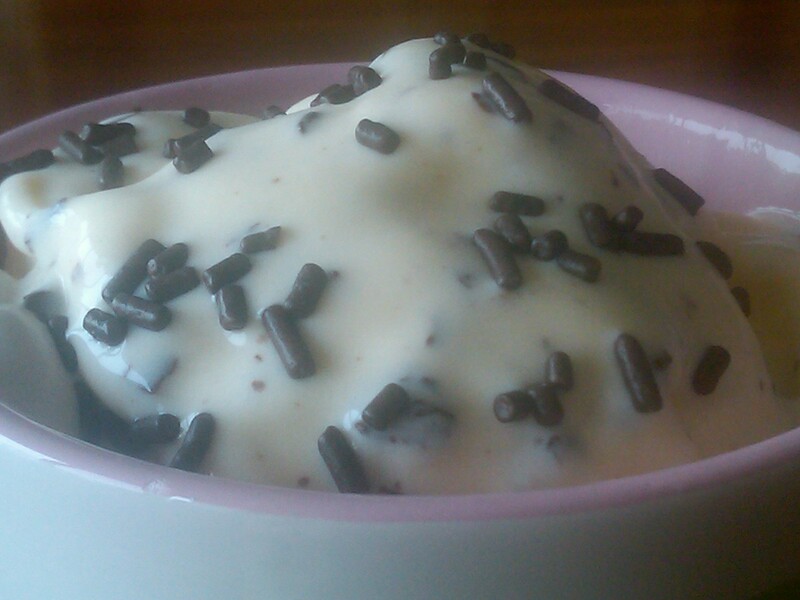 Pour the mixture into the container of an ice cream machine and churn according to the manufacturer’s directions. 3) While the gelato is churning, make the chocolate. (Now the recipe calls for you to melt chocolate over the stove, but all I did was chop up 2 ounces of bittersweet chocolate, finely chopped, and melt it in a microwave safe bowl) – Heat the chocolate on high power for 20 seconds, then stir. Repeat once or twice as needed until almost all the chocolate is melted, the last bites of chocolate will melt just by stirring. 4) Just after the gelato is churned, drizzle the melted chocolate in a thin stream over the top and using a rubber spatula, quickly fold it into the gelato to create ribbons of chocolate. 5) Transfer to an air tight container and freeze for at least 2 hours before serving. Or, if you have no patience like allanabytes, eat it right when it’s done churning – perfectly creamy, chocolately, vanilla goodness. Sidenote/HUGEnote : My whoopie pie recipe/blog post was featured on BON APPETIT – check it out, here!